San Diego – Today community leaders joined Mayor Kevin L. Faulconer and City Council President Georgette Gómez to release the Welcoming San Diego Strategic Plan on Immigrant & Refugee Integration – a community-written blueprint for the San Diego region to welcome immigrants and new citizens as they transition to life in America’s Finest City. With more than 800,000 individuals throughout the region, one in four San Diego County residents is an immigrant. At the news conference at the New Americans Museum in Liberty Station, Mayor Faulconer also announced that his mid-year budget proposal includes the City of San Diego’s first Immigrant Affairs Manager. The position will review the plan’s proposals, guide new policies forward and facilitate the successful integration of immigrants, refugees and new citizens in San Diego. In 2016 San Diego County immigrant households contributed $7.5 billion in federal taxes, $2.1 billion in state and local taxes, and leveraged $16.3 billion in spending power. Immigrant entrepreneurs generated $1.4 billion in business income for the region. The top five countries of origin for immigrants in San Diego County are Mexico, Philippines, Vietnam, China and Iraq. The committee and partner organizations collaborated on the project with a vision of ensuring new Americans can participate in civic life, access public resources and contribute their skills in a meaningful way. With a recognition that immigrants are key to San Diego’s regional economy, the strategic plan presents ideas on how regional institutions can encourage a more connected community. 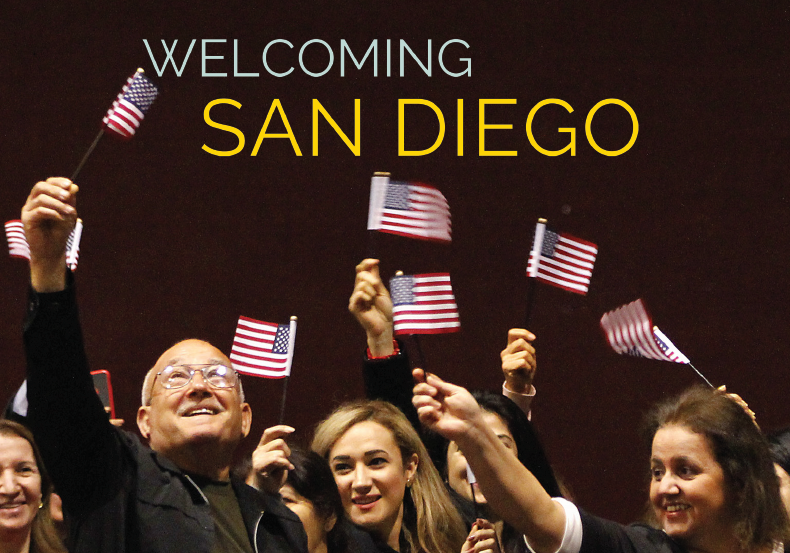 The Welcoming San Diego effort, launched at a kickoff summit in February 2018, was supported by the Gateways for Growth grant from New American Economy and Welcoming America and matched by the California Endowment. The City of San Diego will keep working collaboratively with relevant nonprofits, businesses and organizations throughout the region, and the steering committee will continue to serve in an advisory capacity. “Immigrants are and should be seen as a resource. The Welcoming San Diego plan will allow San Diego to tap into the important asset that immigrants and refugees are for the entire region,” said Juan Pablo Sanchez, local business owner and board member of Business for Good.